There are fake tapers that use the earring to imitate a taper. This taper is even easier. This one doesn't even require an earring. 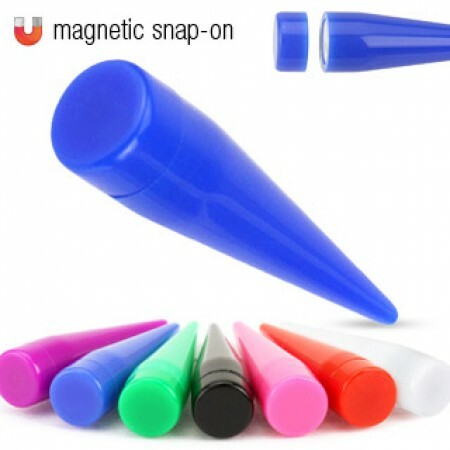 This fake taper works with a strong magnet. Strong enough that easily goes through a thick earlobe. With a striking size of 8 mm in diameter these fake tapers allows you to easily get the look as if you're already stretching for a long time. We couldn't resist and had to try these tapers out for ourselves. Although we didn't feel a thing we could imagine that your earlobe might get a bit sore if you wear this taper for days on end. An important advantage of the magnets is that the taper presses itself gently into the earlobe (the earlobes folds itself around the taper) This is a result of the pulling forces of the magnets and makes it look extra real as if the taper really does go through your ear. All in all, we are more than enthusiastic about these fake tapers. These fake tapers come in a wide variety of vibrant colours.